What battery capacity do I need to fit a Mass Combi 12/2000 or 24/2000? A simple rule of thumb states that a 12-volt system needs a minimum battery capacity of around 20 % of the inverter capacity, while the corresponding figure for 24-volt inverters is 10 %. The battery capacity required for a 12-volt Mass Combi 2000 is therefore at least 400 Ah, while a 24-volt Mass Combi 2000 needs at least 200 Ah. How much power does a Combi use? The efficiency of Mastervolt equipment is very high due to the application of high frequency (HF) technology. If the Mass Combi needs to power a Senseo coffee machine (1450 watt) for instance, power consumption will be 1450 watt divided by the onboard voltage of 12 volt = 120 amps. Making a cup of coffee takes less than a minute, so consumption in Ah can be considered fairly small at 120 x 1 min = 2 Ah. The power used by the inverter itself is negligible. Does the Combi need a lot of ventilation? The Combi (if installed in a cabinet) needs very little ventilation – two approx. 80 cm² (9 x 9 cm) ventilation openings are the minimum required. Combis that are used in high ambient temperatures, or are expected to be operating at full capacity for a long period, require openings that are at least four times as large. How thick should the battery cables be? To calculate the right cable size, determine the highest possible current which will flow through the cable. For the Combi this is the inverter current. When running at full capacity, a 2000 W inverter for instance draws around 200 amps from the batteries (100 amps for a 24-volt system). The rule is simple: For every 3 amps you need 1 mm² in cable thickness. The advice for a Combi 12/2000 would be 70 mm² cable thickness and 35 mm² for a 24-volt version. Is the Mass Combi noisy? HF technology has rendered large low frequency transformers obsolete, so you no longer have the irritating humming sound generated by equipment with a large transformer. Ultra quiet and temperature-regulated ventilators take care of the cooling, ensuring that noise levels are kept low. The only remaining sound is the soft hum of the cooling air. A Mass Combi can therefore be installed virtually anywhere. Can I reduce the power intake in situations where power is limited? Yes. The Mass Combi comes with Power Sharing and Power Support function. Power Sharing ensures that the battery charger in the Combi automatically switches to a lower capacity as soon as a given preset value is reached. This value usually corresponds to the available AC power fuse or generator capacity. The current required by the battery charger and the current required to power connected equipment are added up. Should the total exceed the pre-set critical value, the battery charger current will be automatically reduced to the extent where grid or generator power intake is equal to the pre-set value. The battery charger can even be set to operate at zero-amps charge current. If the output load of the Combi exceeds the preset value of, for instance, the AC power fuse, the system will quickly switch back to the inverter: This prevents the power fuse from blowing or the generator from becoming overloaded. Once the current required to power the connected equipment becomes lower – when a number of appliances have been turned off, for example – then the system will switch back to incoming current and the batteries will be recharged again. The value for maximum power intake can be adjusted via the optional remote control panels or by DIP switches in the equipment. Do I need a transfer system? A transfer system is not needed. 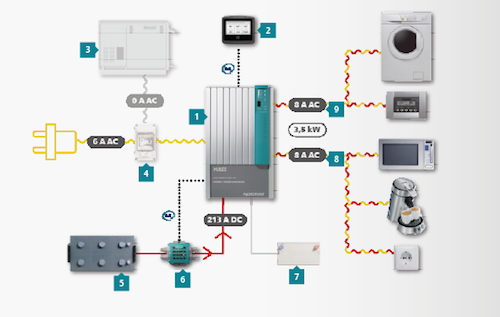 In case you have only one 230-volt connection, using a Mass Combi brings an integrated transfer system between the incoming current and the inverter current. Incoming 230-volt power current is automatically directed to the outlet and the batteries are charged. The inverter will immediately take over should the 230-volt input drop or be switched off, resulting in virtually no interruption. The Mass Combi Ultra even allows you to directly connect two 230-volt connections; a mains/grid connection and an AC generator. 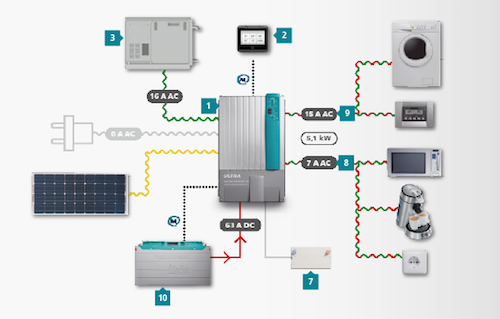 The Combi Ultra automatically switches between all power sources, including the inverter. Can I power a computer with a Combi? Yes, the Mass Combi can easily and safely supply a computer without the slightest problem or risk. The Mass Combi Ultra can even function as an emergency power system. If, for instance, the 230-volt grid drops, the Combi will automatically switch over to inverter operation. As the switching time is very short and the inverter was already keeping up with the incoming voltage in standby-mode, the computer will continue to work normally. Once the mains is restored, the system switches back to charger operation and the incoming voltage from the grid or generator again powers the computer. The Mass Combi MasterAdjust software allows you to set the minimum level of grid/generator voltage at which the Combi is switched on. Does the Mass Combi work with washing machines? The Mass Combi can easily power a washing machine. One whole washing cycle will, on average, take 80-100 Ah (with a 12-volt system), and 40-50 Ah (with a 24-volt system). Most of the energy is used to heat up the water, so consumption is properly correlated to the water temperature. Washing your laundry will put considerable strain on your battery for a short period of time, so it is important that battery capacity be sufficient: 600 Ah should be enough for a 12-volt system and 300 Ah for a 24-volt one. Can a Combi power a microwave? Yes, all microwave models can be connected to a Mastervolt Combi. Bear in mind that an 800-watt microwave consumes 1200 to 1300 watt from the 230-volt system, and that the capacity of the Combi (inverter) must be able to handle this. Apart from this, the total consumption of the microwave is modest: Five minutes of microwave use will consume around 8 Ah on a 12-volt system and 4 Ah on a 24-volt system. A combination microwave with oven and grill can also be connected to the Mass Combi. As power consumption will be high when the oven and the microwave are used simultaneously, you will need a robust battery of at least 600 Ah for 12 volt and 400 Ah for 24 volt. Can I parallel connect Mass Combis? Yes, the Mastervolt Mass Combi 2500 W and Mass Combi Ultra can be parallel connected without any problem. The Mass Combi Ultra can even be connected in parallel up to ten units. Such a set-up means that you double the inverter capacity as well as the charger capacity. With more batteries or a need to power more equipment, parallel connect a second Combi to the existing one. This doubles the available inverter and charge capacity. No additional equipment is required, apart from the connection of a few signal cables. It will, however, be necessary to adapt wire and cable diameters in the system to cope with the increased capacity. What is the Power Assist function? Mastervolt Mass Combis are equipped with an extremely advanced system to prevent the AC power fuse from becoming overloaded. The output current of the battery charger is reduced as soon as there is a risk of this happening. If this proves insufficient, the system rapidly switches to inverter operation so that the battery temporarily powers a part of the connected load. Since the inverter will already have been synchronised and the switching is so fast, computers will continue functioning, as will clocks and timers on, for instance, microwave ovens. Once the load decreases, the system switches back to power and the battery charger returns to charging the batteries. Your Combi can therefore also function as an efficient emergency power system. Higher consumption than available from the grid. The electrical system is connected to the grid. The circuit breaker is limited to 6 amps. Several 230 V appliances are switched on, consuming 3.5 kW. A total of 16 amps is required. The additional 230 V (10 A) is supplied via the service battery and the Mass Combi. Automatic switching off prevents excessive discharge of the batteries. You can program the setting via Power Sharing in the Mass Combi, or remotely using the EasyView 5 panel. Mass Combi (Ultra) inverter/charger combination. EasyView 5, control panel for all devices in a MasterBus network. No grid - only generator and battery power. In this case your power sources are a generator and the grid connection. Both sources can charge the batteries and provide power to the connected consumers. The Mass Combi Ultra regulates supply and demand and can optionally even start the generator through MasterBus. 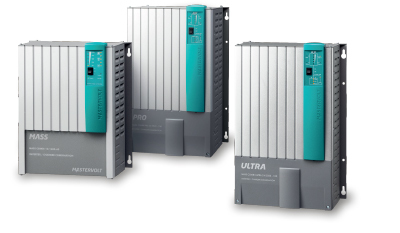 In case of large power demand, the Mass Combi Ultra provides additional AC power from the Lithium Ion battery, in parallel with either the generator or the grid connection. This way you can operate larger loads without overloading the generator or blowing the main fuse.